This post is in partnership with the PRIMP Network. Products have been provided by Suzanne Somers. All opinions are my own. 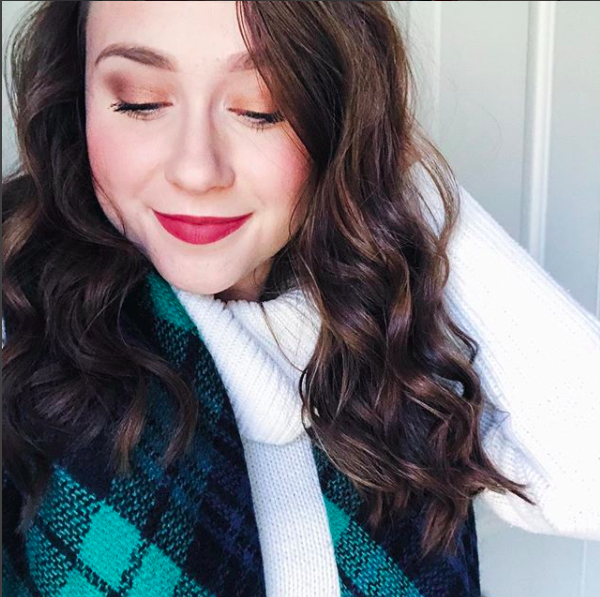 I absolutely LOVE trying out new beauty products, and I've recently really gotten into trying out organic products. I've noticed a huge difference in my body when I use products that are simply more healthy. I'm partnering with Suzanne Somers today to share with you all some fabulous organic beauty products that you'll love! First off, let's talk about Suzanne Somers. 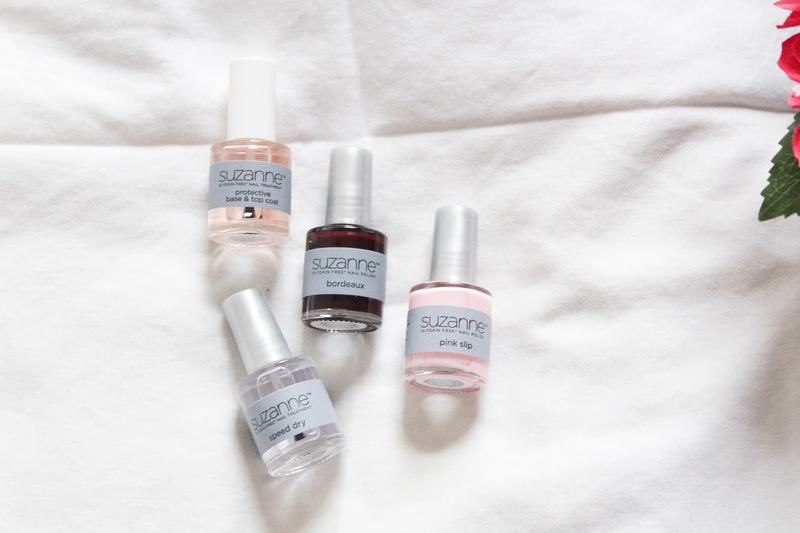 Suzanne Somers, the creator of the Suzanne Organics line, chose to create a line of makeup and beauty care products made from natural extracts. It's actually kind of gross when we think about how many chemicals are in the everyday beauty products that we use. 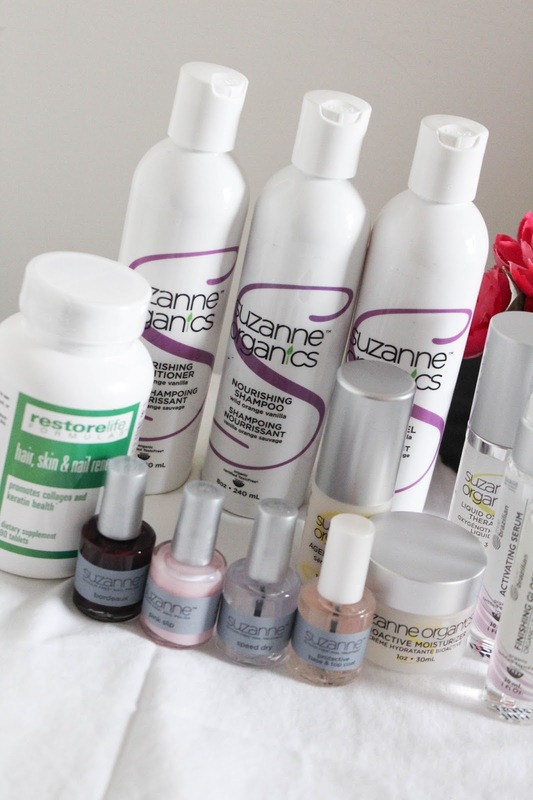 Suzanne Somers has developed beauty products that are pure, clean, easy, and fun of course! Nail polish is truly an obsession of mine! I was so excited to find out that Suzanne Somers offered nail polishes. I'm currently loving them!. My favorite shades right now are "Pink Slip" and "Bordeaux." I also grabbed the protective base/top coat as well as the speed dry top coat. I've been painting my nails on my own for as long as I can remember. It's always nice finding an amazing polish that doesn't contain a bunch of chemicals! The speed dry top coat has been a LIFESAVER. Since I almost always paint my nails rather than getting them professionally done, it's amazing to have a quick-dry top coat that works so I can continue to go about my day after painting my nails. While being chip-resistant and shiny, these polishes are also free of some of the worst toxins that are typically in nail polishes. As many of you know, my skin is definitely acne-prone and sensitive. I was honestly nervous to try organic skincare products, because I feel like everything breaks me out. 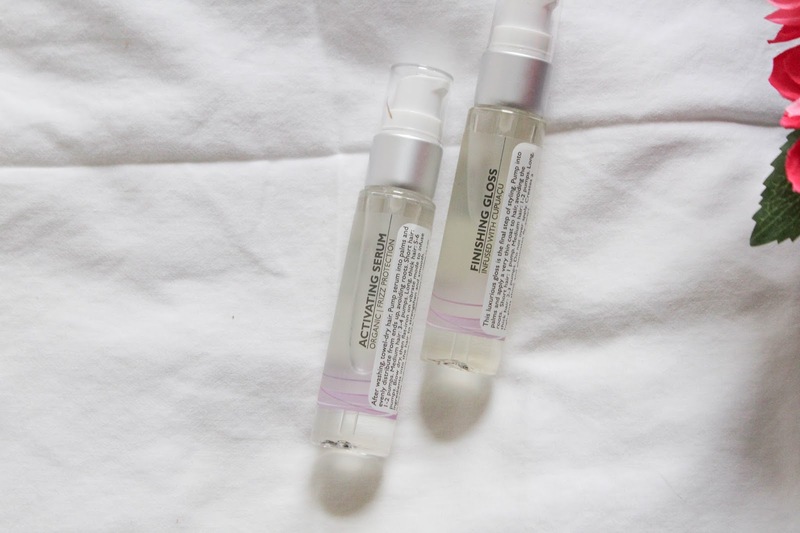 To my pleasant surprise, I found that the Suzanne Somers 3-Piece Skincare Kit not only didn't break out my skin, but it actually seemed to make my skin look better! The Ageless Serum, Liquid Oxygen Facial Serum, and Bioactive Moisturizer all target fine lines and wrinkles for a more youthful and glowing complexion. The Suzanne Somers 3 Piece Organic Hair Care Set has been amazing for my hair lately! I've always struggled with fine, flat hair but Suzanne Organics offers products that give my hair life, body, and a healthy glow. Suzanne Organics Hair Care products use Cocoa Butter cleansers for mild lather that gently and thoroughly cleans hair without residue. The conditioner contains high performing superfoods to strengthen the hair shaft while enhancing elasticity for shiny, stronger, hydrated, and more luscious hair. I've also been trying out the True Brazilian Activating Serum and Finishing Gloss Combo. These hair treatments straighten hair, reduce frizz, and promote a silky, soft texture. This incredible salon-like treatment is just like popping into the salon to get your hair done! I was blown away by how nice my hair felt after just one use. 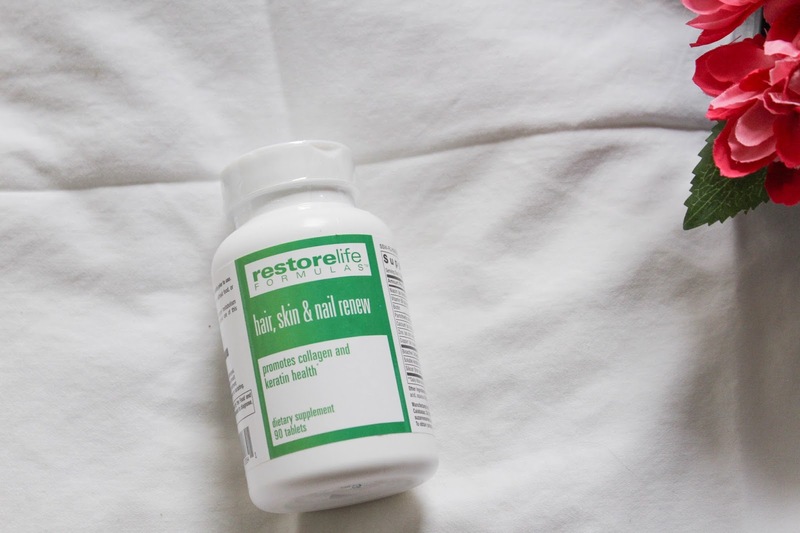 The RestoreLife Forumlas Hair, Skin, & Nail Renew has been a daily essential for me. These supplements are available on the Suzanne Somers website, and they're truly a necessity. The proteins in these supplements keep hair, skin, and nails looking youthful, healthy, and vibrant. Ingredients such as Cynatine® HNS Plus, VERISOL® Bioactive Collagen Peptides®, and silicon and biotin will help restore beautiful hair, radiant skin, and healthy nails. 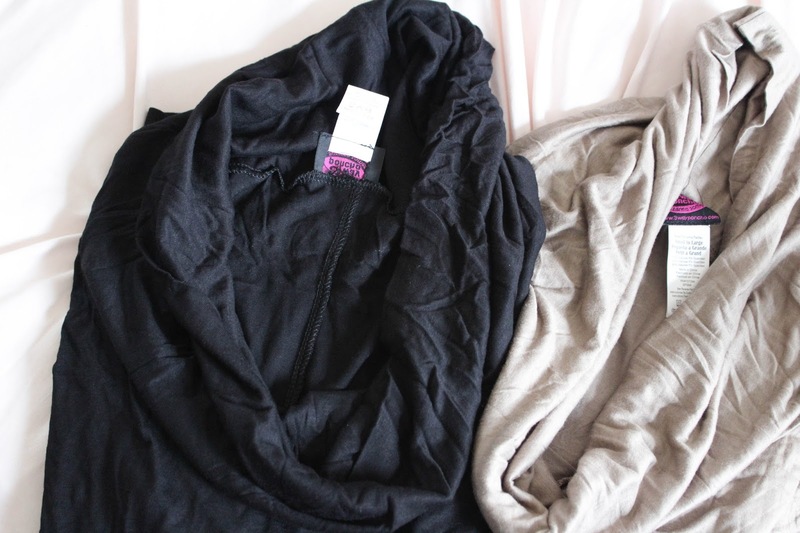 Lastly, I grabbed some of these 3-Way Poncho tops from Suzanne Somers and they've been some of my favorite shirts lately! They're so comfortable and look great with leggings (my favorite choice of pants). It can be worn as a cowl, hoodie, or off the shoulder. My favorite way to wear it is off-the-shoulder... perfect for spring! 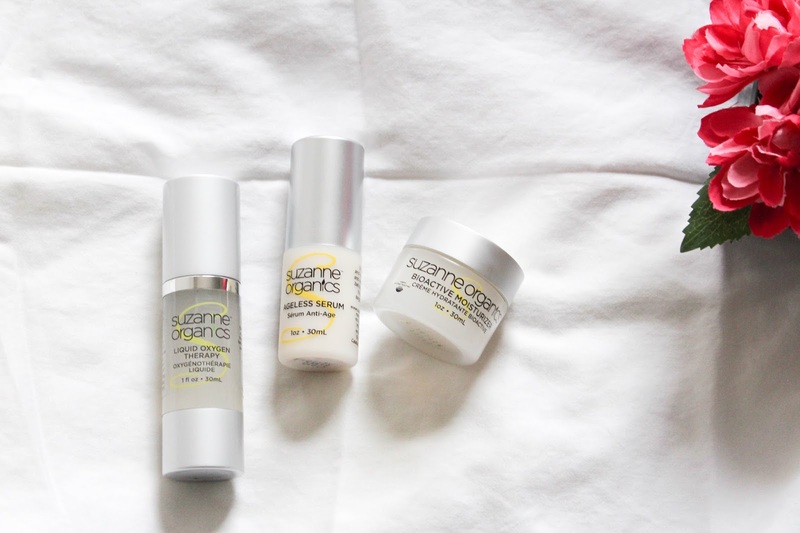 Have you tried out any products from Suzanne Somers? What are your favorite organic products? Let me know! Pink Slip and Bordeaux both look gorgeous! How long do they usually last? My problem with nail polishes is that they chip so easily and it gets too annoying to constantly reapply/fix. Wow... this is really great. I just love these organic products. These are really good for health. Great share!! I love the valuable information shared, it's really very helpful. I would like to share a product which I had used recently and it had worked great on my skin that's Dermology skin care. It's a great product and I would recommend it to everyone. Nice post! The content is really very informative. In order to get beautiful and wrinkle free skin, one can also use Revitol anti aging cream. This is an amazing product and shows desired results within a week. One should give it a try.